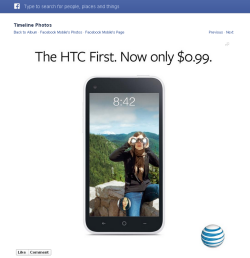 Facebook phone sale: HTC First now just 99 cents on ATT store. The “Facebook phone” is on the clearance rack. I’m not one to criticize a good bargain, but this cannot be a good sign for the popularity of the new “Facebook phone”: Less than a month after it launched, the device is on sale for 99 cents with a two-year AT&T contract. In other words, the HTC First is already in the bargain bin. HTC wouldn’t share the exact sales figures for the device in its first-quarter earnings call. Regardless, as CNET’s Jennifer Van Grove points out, the price cut isn’t likely to do Mark Zuckerberg any favors as he tries to pitch other smartphone makers on the merits of packaging future devices with Facebook Home. In fact, I suspect Facebook would have been happy to see the phones go for 99 cents with a two-year contract from the moment they launched, rather than starting at $99.99. Unfortunately for HTC, not every company can lose money on every sale but make it up in volume.